It’s often believed that a home is a perfect reflection of the people who live in it. Be that as it may, it’s also important to think of a home as a reflection of what the people living in it truly value or what they aspire for. As far as purposeful design goes, films offer a wealth of potential themes, since their set pieces go beyond aesthetics to convey ideas. Below, movies* renowned for home design to stimulate your creativity and help you stay inspired. In The Intern, Anne Hathaway plays Jules Ostin, a Type A startup CEO who lives in a Brooklyn brownstone with her husband and her young daughter. A haven for hip, modern design, the apartment features mismatched chairs, a brushed brass chandelier in the dining room, and a mix of trendy and antique furnishings in the bedroom. The kitchen especially stands out: Decorated with open shelves, a white subway-tile backsplash, some pendant lights, marble countertops, and a farmhouse sink, it’s the perfect combination of industrial and rustic elements. Eclectic, warm, and interesting, this aesthetic is perfect for those who value an unpretentious, lived-in feel over designer-driven interiors. 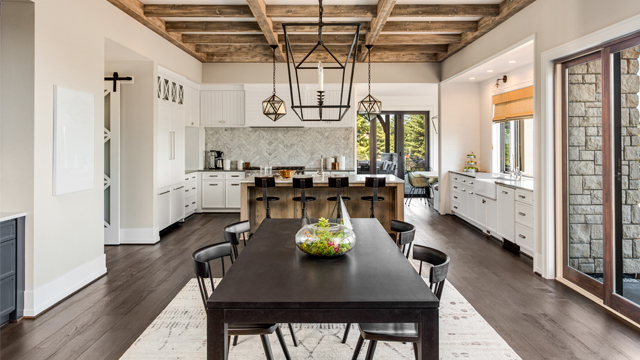 Complement a hardwood island table with wrought iron, geometric pendant lights for a rustic-industrial aesthetic. The chic Hamptons home of Diane Keaton’s character, Erica Barry, in Something’s Gotta Give is one of the most praised movie houses in set design history. Every detail in this coastal retreat captures laid-back elegance—from the cushy, buttery beige couches that frame a cozy writing nook in the living room, to a massive bookcase that displays nearly three dozen plates in the dining room, to the eggshell cabinets and soapstone countertops in the kitchen. Mostly done in warm, sunlight-reflecting whites and soft neutrals, these interiors are ideal for those seeking to bring a sense of sanctuary to their homes. 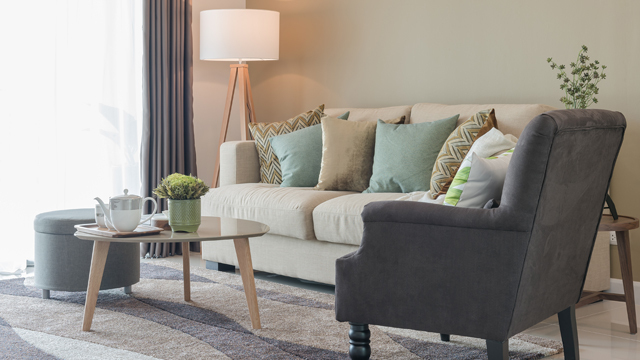 Warm and soft neutrals can make a room more welcoming. Independent individuals who value structure and polish, but also want something that’s cozy and organic, will find much to love about the L.A. digs of Amanda Woods, the hard-driving executive Cameron Diaz plays in The Holiday. The immaculately designed interiors of this home feature a high-contrast color scheme (white and ecru against dove gray and black), layered textures (hand-painted tiles and molded cabinets) and natural elements (dark wood and seagrass rugs). The overall look? A clean, modern, fuss-free, and carefully designed abode. Contrasting colors and patterns can give a room more visual appeal. Mix them with neutrals to help relax the design scheme and give space for your eyes to rest. For anyone looking to add glamour and grandeur to their home, Baz Luhrmann’s The Great Gatsby provides a treasure chest of inspiration. Each room in the Buchanan mansion brilliantly captures the Art Deco aesthetics of the Roaring Twenties, and this is most evident in the sitting room of lead character Daisy Buchanan, played by Carey Mulligan. 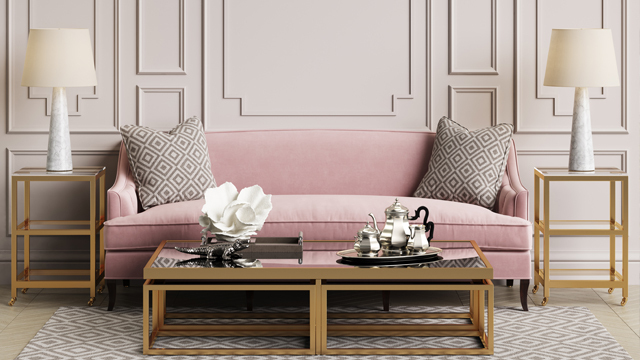 The airy, light-filled space, is swathed in soft, feminine colors such as pink, salmon, gold, and champagne. Stained hardwood floors perfectly set off plush armchairs and a chaise longue, patterned cushions, ornate side tables and lamps, massive spring bouquets, and a beautiful circular area rug with a geometric print in bold red—the room’s focal point. It’s the ideal living space for the archetypal girl’s girl. Wall molding adds power and energy to a room. Soften the space or make it feel more delicate with feminine touches like florals and pastel colors. Every one of Wes Anderson’s films is eye candy, but it’s nearly impossible to top the interior magic he created for The Royal Tenenbaums. In this dark, offbeat comedy, the titular Tenenbaum family lives in an outlandish home decked out in Anderson’s signature hues of dusty rose, creamy beige, and powdery pink, and quirky, unexpected details that include zebra wallpaper, tasseled sofas, a glowing globe, and even an indoor telephone booth. Whimsical homeowners, whose tastes run to the offbeat and eccentric, will certainly find enough inspiration from this movie. 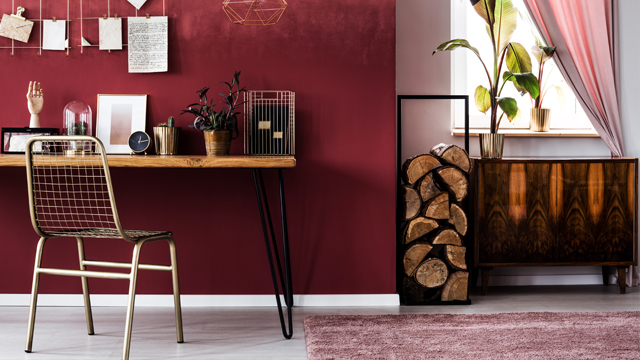 Quirky details and decor don’t always have to be functional; sometimes, it’s just about finding pieces that appeal to your personality to create your own unique space. Your dream interiors will shine even more within a comfortable, roomy space, like the apartments at TheProscenium Residences by Rockwell. Balancing form and function with contemporary luxury, The Proscenium Residences offer spacious and well-appointed units that can be designed to suit one’s lifestyle, personality, and ideals. 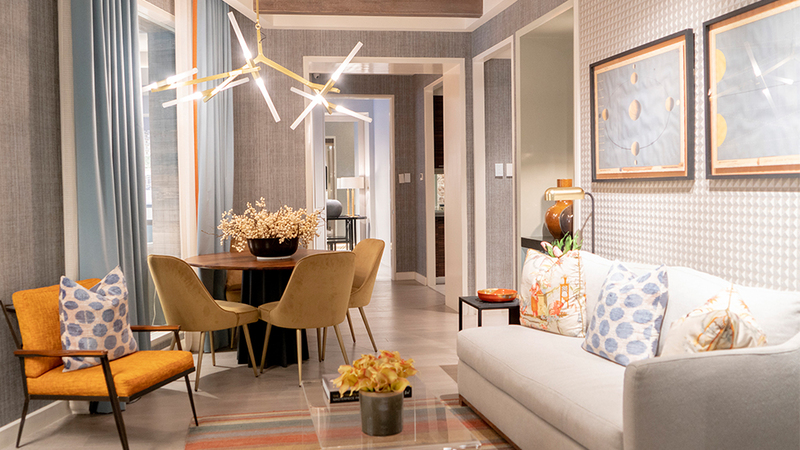 Whether you opt for a cozy studio or a three-bedroom home, each of these high-ceiling spaces provide the perfect canvas for filling in with pieces of your preferred aesthetic. Visit the Proscenium showroom in Power Plant Mall, Makati, to envision how you can incorporate ideas from your favorite film into your personal space. Check out The Proscenium at Rockwell website, or follow Rockwell Land on Facebook to find out more about the property. *The photos used in the article to depict each interior design theme are only inspired by the films and not taken from the films directly.